Every part of the novel-writing journey is painful interesting, but the most interesting of all has to be the last few days leading up to a release. Under no other circumstances in my life do I experience such an intense combination of excitement and abject terror. The idea that my work is about to go out there for everyone to read—painfully akin to being stripped naked and critiqued by perfect strangers—has, at times, overwhelmed me to the point of barely being able to draw in a breath and seriously considering calling the whole thing off. Minutes later, the idea that my work is about to go out there for everyone to read—thereby bringing the circle that is the writing process to completion and fulfillment—can fill me with inexpressible joy and anticipation. My thoughts swing wildly from one end of the expectation spectrum to the other as I wait for the big moment to arrive. This book could sell thousands of copies and make me a best-selling author. No one will ever hear about, let alone read, this book. What I’ve written could actually change the world. The legacy of this novel will endure long after I have gone to the grave. This novel will sit on my parents’ shelf, gathering dust, until it is eventually bagged up and carted off to a thrift store. The process is crazy-making; there is no doubt about it. Thankfully, there is an out to the temptation to work myself into a near-catatonic state of over-anxiety and unrealistic expectations. I can remind myself that it doesn’t matter. Not even a little bit. The story came from God. I have no doubt of that. I am deeply aware, as I am writing, that the words are not coming from me but from a source outside of and greater than myself. And since God doesn’t do anything without a purpose, it follows that he has a plan for my novel. That plan may be for millions of people to read it. For what is contained between the covers of my book to change the world forever. Or for the impact to echo down through generations like a shout hurled into the vast depths of the Grand Canyon. Or it may be for ten people to take a look at it, nine of whom will toss it aside, unmoved, and forget about it immediately. If that one last person is meant to read it and somehow be changed or impacted by it and that is what happens, then in God’s economy the novel will have been a resounding success. And as a believer, it must then be a resounding success in my mind as well. Order a copy and read it immediately. Or don’t. But if you think of it, do say a prayer that God will use it for whatever purpose he has in mind. Which is the greatest expectation for my work that I can have. 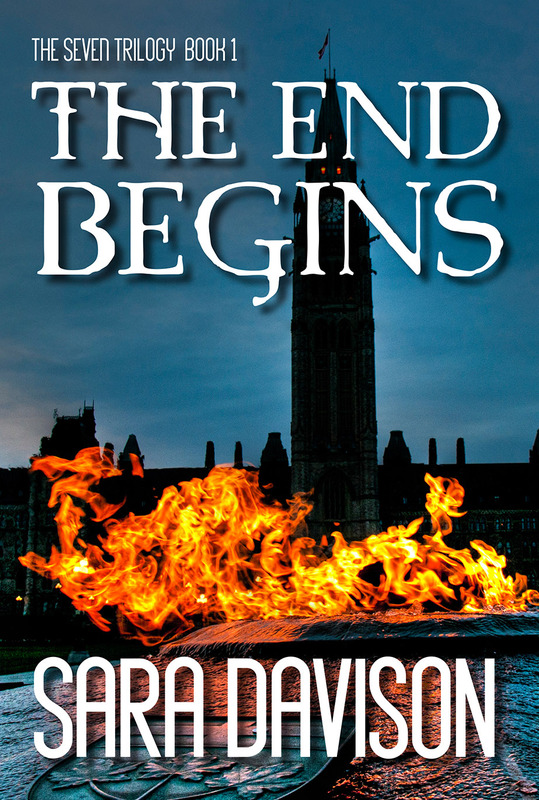 This entry was posted in Fiction and tagged book release, Sara Davison, The End Begins, The Seven Trilogy, The Watcher by Sara Davison. Bookmark the permalink. This is very encouraging to me. Thanks! Great attitude to have. As long as you are following God, the visible outcome really doesn’t matter. The success of this world is nothing compared to His victory! Best of luck to you! Thank you Kelsie! I appreciate that encouragement. In God’s economy, you are exactly where you need to be. Now add to that trusting God to provide financially if his purpose for the book is to only reach that one person (I know that is the part I struggle with). God bless on your journey!